I have it on good information that with the films DVD release, the extras will include a segment about the controversial editing. As this photo shows Tom Cruise will portray Harvey Weinstein. "Don't never go full re-dux..."
An unretouched still from the movie, which features actual, on-the-scene SEAL Team 6 footage of The Night Obama Killed Osama™. I don't understand. Does Dear Leader Obama have his leg lifted to pass wind, or to mark his territory? In the actual Situation Room photo, fearless leader looks more like a scared child hiding in the corner. 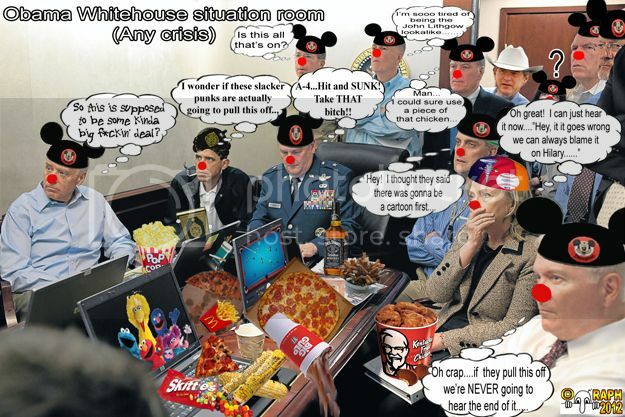 The situation room photo you posted is the Photoshopped image currently available everywhere. b) the "Obama" seen here is actually a double - the real Obama was, of course, on the ground and on target with SEAL Team 6. Comrades, I would like to clarify the look of intence dislike you may be perceiving on dear leaders face in the situation room: The peoples helecopters took off to Pakistan without the benifit of Grand Marshall Obama. He is therefore unable to negotiate in person with Osama bin Laden. or give the order personally to deny a rescue attempt, should it have become nessesary. We at the bureau have heard rumors to the effect, the dear leader was somehow in over his head or scared. anyone caught spreading filthy capatalist lies will be dealt with most severly. Plus, it's important to remember that the "Obama" seen here is actually a double - the real Obama was, of course, on the ground and on target with SEAL Team 6. 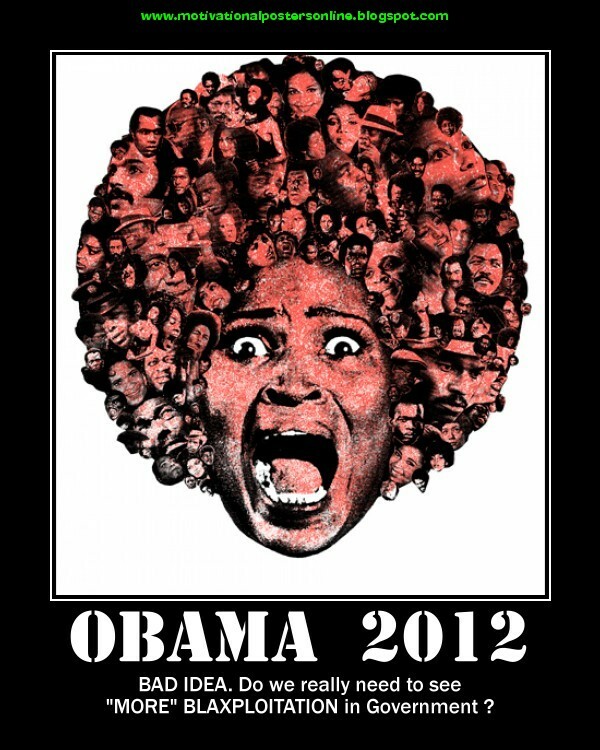 So, there is an actual "real" Obama, one that isn't a composite? Which of our other socialist heroes does he most resemble, Lenin, Stalin, Mao, Pol Pot, Che, Mugabe, or Jim Jones? Who's killing who? I am confused. All together they (the assembled leadership) are killing time? Is 'The One' killing the "Other' on X Box? Is 'The One' killing the 'Other' softly with his love? The MTE appears to be barfing. Perhaps she is dying from embarrassment? The assistant to 'The One' otherwise known as "the Gaff' to the Secret Service appears to be playing with himself. Perhaps he is killing future desires for the MTE? The only one who appears to be gainfully employed is the female pickpocket at the rear. Why is Tingles aka Crass Misuse not shown in the photo? He is certainly in the building. What is this, some sort of weird blacksploitation movie, comrades? It is apparent from the photo, no one in the “situation room“ knows what this meeting was called for. MTE believes this is an untimely photo opportunity for the whole gang!! Last edited by General Confusion on 11/8/2012, 7:10 pm, edited 2 times in total. People's Movie Review: "V" stands for "Vapid"